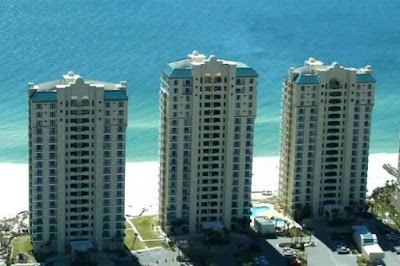 Property Info: 3BR/3BA beachfront unit with 1,100+ sq. ft.
Perdido Key Florida Gulf-front condominium home for sale at Beach Colony Resort. Exceptional views of the Gulf of Mexico from this spacious residence at Beach Colony. This resort home features custom wood plantation shutters throughout, solid-surface kitchen counter-tops, eat-in kitchen with a separate pantry closet. The master boasts incredible views of the gulf with floor-to-ceiling sliding glass-doors providing extra light and views. Master bath has double vanities, a jetted-tub with a separate walk-in shower. This complex has only 4 condos per floor, offering a unique resort experience to relax and unwind; other community amenities include a hot-tub/spa, tennis courts, an exercise facility, beach boardwalk & more! This condominium home has amazing rental potential – onsite association management.